This book is one of several family-focused writings by the Wilsons. When I lived in Idaho, I attended Doug Wilson's church and find his writing style to be identical to his speaking style. To read his writings is to hear him talk. You can almost see the twinkle in his eye that he gets when he knows he's said something clever. Several things that he said in this book I heard spoken from the pulpit so in some respects I glazed over portions of this book. Perhaps I've been over-Wilson-ized in some respects. I don't know. But refresher courses never hurt anyone...particularly when they are in a position to begin applying the things that they have previously heard written and spoken. Here's when the rubber hits the road, so to speak. "My elect shall long enjoy the works of their hands. They shall not labor in vain, nor bring forth children for trouble; for they shall be the descendants of the blessed of the Lord, and their offspring with them." Neither Jonathan or myself intend to work in vain. I certainly do not intend to labor in vain. I cannot fathom the concept (as I've said before) of giving birth to a child without having some hope that s/he would know the saving grace of God. 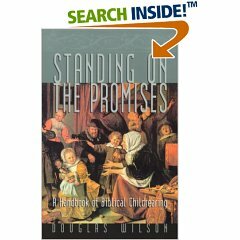 We agree with Wilson in stating that the young child should be treated like the old Christian and spoken to as if they can comprehend scriptural truths instead of watering it down. Now, I do not think there are any guarantees. I DO believe parents are given clear direction on how to raise children in scripture. We are to speak with our children about the things of God and make a daily demonstration in our own lives (business practices, the things we say and the words with which we choose to say them, the friends we have, the events we attend, etc.) of what we believe. In effect, the first responsibility we have to our children is to live honestly ourselves. Lastly, I shall comment on Wilson's view that children are capable of figuring out what is right and wrong from an early age. Oftentimes we've bumped into parents who have informed us that they "haven't started disciplining yet." This said, of course, when the child is above the age of 1. Amazing sinless children? I hardly think so. If the child is whining, Wilson says, s/he is doing so because s/he knows that it produced a certain effect. I.e., it gets them what they want. If they are cognizant of being able to whine for candy or a toy, they are capable of understanding the word "no" and "stop whining." They already have a working knowledge of cause and effect and therefore are capable of understanding you putting a stop to certain behaviors. I know that any of my children will be very cute. I know that I will think everything they do is cute. I also know (in the back of my mind) that one day it won't be so cute. And I know that on that future "non-cute" day I'll wish I had been more consistent early on. So here we are! Embarking on the great adventure known as Parenting. We can't say what will happen or exactly what we'll be like as parents. We can't claim we'll discipline effectively, consistently or brilliantly. We can only say that by God's grace we'll carry on and do our best, day by day, hour by hour and, quite likely, minute by minute! But that's our calling. To stay alert. To teach our children the way in which they are to go. To pray for them. To nurture them. To love them.